Community members, staff, and inmates gathered at Goose Creek Correctional Center on July 27, 2018 for Community in Unity. Many crimes are fueled by drug and alcohol addictions. So what can prevent some criminal activity? Helping people receive treatment. During Community in Unity: Recovery Behind Bars, inmates, staff, and other community members gathered inside Goose Creek Correctional Center near Wasilla to share stories about treatment, crime, and recovery. The public event was held on June 27, 2018. This recording was edited for clarity and length. 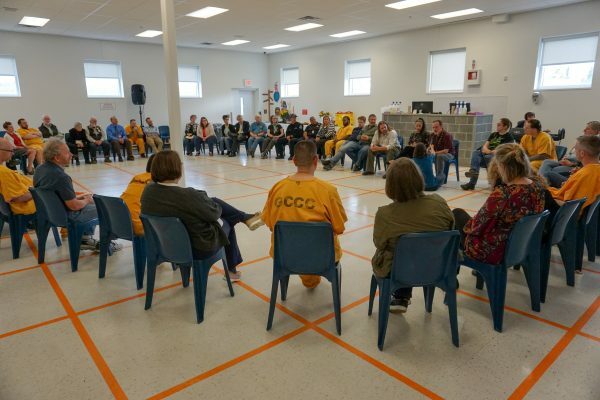 Listen to other episodes of Community in Unity here, including conversations recorded inside Spring Creek Correctional Center in Seward and Fairbanks Correctional Center in Fairbanks.